Over the last six months several developers have worked on a Japanese version of the XPages Extension Library. Recently they released the 1.0 version after some previous beta versions. and Masahiko Sato from Neoaxis. Here is Sato's description of the project: "This project includes localized sample applications and XPages controls including the user interface of Domino Designer. Those modules will enable Japanese XPages developers so that they can create more valuable XPages applications for Japanese customers effectively. The project members, business partners including IBM Champions and IBMers will work to develop brand new Japanese marketplace specific XPages controls in the future. And, it will be available soon as release 2.0 of Extension Library Japan." 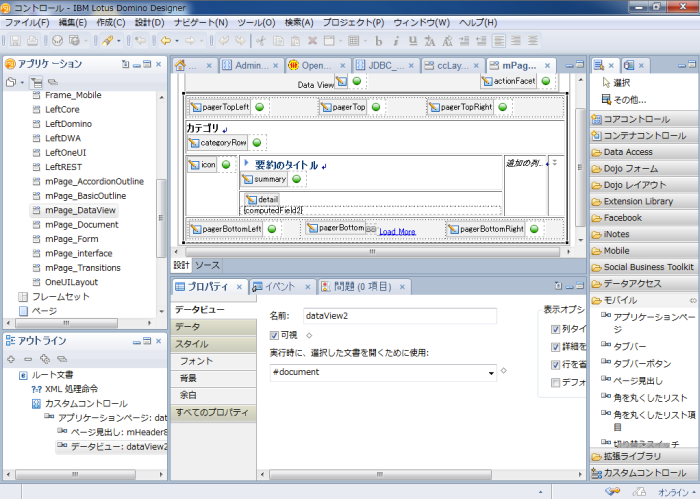 Below is a screenshot of the Japanese IBM Domino Designer with the translated extension library.